Very young babies will love snuggling up with this soft, padded cloth book with a crinkle noise on every page! Stroking the sheep's woolly tummy, rubbing the shiny butterfly and feeling the dog's velvety ear will help to stimulate developing senses. Perfect as a very first book for children. Baby Touch is an innovative and award-winning range that provides a sensory feast for babies, stimulating their growing minds and active senses in the developmental steps from birth. This range of books are perfect for a baby and adult to enjoy together. 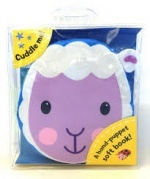 Cuddle up at bedtime with Sleepy Sheep!